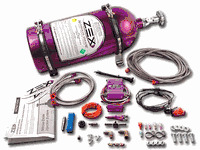 The ZEX Wet Nitrous Kit is designed to work safely on stock type Dodge Neon engines but is also engineered to perform flawlessly on highly modified turbocharged and supercharged combinations, including the Neon SRT-4. It is a simple, 2 hour installation and the kit includes proper tuning jets, a range of fuel tap fittings, solenoids, filters and activation electronics that are factory pre-assembled in the Nitrous Management Unit. The part number for this item is 82021 and it fits 1995-2005 Dodge Neon and Dodge Neon SRT4 models.